An Interview with Nathan McCall. · One Book. One Author. One Hour. 1:42 – McCall came to be on Booknotes because his publisher, Random House, worked hard to get him and his book on the program. 2:40 – There were few minorities who appeared on the program, giving McCall the sense that the minorities who worked at CSPAN were glad to see him when he arrived. 3:58 – McCall’s publisher helped to prepare him for his appearance on Booknotes by seeing a media specialist as part of a broader book tour preparation. 6:35 – The longer format of Booknotes was preferable to the usual three-minute interviews. The content of the book, a semi-autobiographical work about race, was particularly difficult to discuss in such a short amount of time. It was also clear in the shorter interviews that the interviewer had not read the book. 8:59 – Lamb’s intense preparation made McCall relax more because it meant that Lamb thought intensely about the book, its issues, and the questions. This allowed for a substantive conversation. 12:36 – Based on the questions he has gotten from readers, McCall thinks that the general public finds the details about the process of writing interesting. 15:44 – McCall was not surprised by any of Lamb’s questions. But based on past experiences, he was slightly surprised by Lamb’s ability to maintain a neutral stance during his interview, as other interviewers had been very overt in their political opinions. 20:00 – McCall watched Booknotes before and after his appearance on the show. But following the appearance, he paid more attention to Lamb than whatever author happened to be on the show. 21:34 – McCall is also a journalist and was impressed with Lamb’s questions and his ability to grapple with tough issues. He strives to mirror these strengths in his own work. 32:09 – McCall doesn’t recall much about the Booknotes studio, but does recall meeting the CSPAN and Booknotes staffers before and after his interview. The simple set reflected Lamb’s insistence that the substance of the interview take precedence over everything else. 34:50 – McCall thinks that the Booknotes collection is significant because of the importance of non-fiction works. 36:04 – McCall interviewed with Lamb on another program and would have absolutely appeared on Booknotes again if asked back. 37:07 –McCall is not certain if his appearance impacted sales of his book, but many people asked him about the program, making him certain that lots of interested readers watched it. 45:12 – Appearing on the show reinforced for McCall what an interview should be. 46:59 – Since appearing on Booknotes McCall has worked on a book of essays, a book on gentrification, a book of short-stories, and has continued to work as a journalist. 50:30 – The lasting impact of Booknotes is that it is the standard for substantive interviews on television. Misha Griffith (Oral Historian) , “An Interview with Nathan McCall.,” One Book. One Author. One Hour., accessed April 21, 2019, http://booknotes.gmu.edu/items/show/2802. 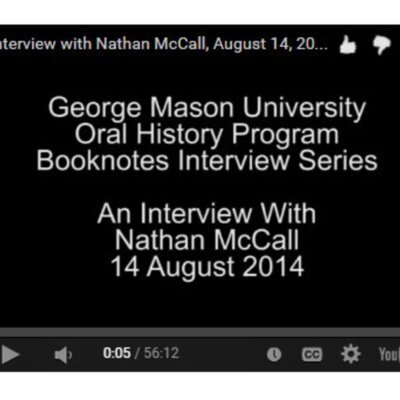 Nathan McCall is interviewed as part of the Booknotes Oral History Project on 14 August 2014. Mr. McCall discusses his appearance on C-SPAN's Booknotes program on March 6, 1999, where he discussed his book "Makes me wanna holler : a young Black man in America." Booknotes Oral History Series. R0143 Box 01 File 19.